We have built our reputation on being a true custom builder. If you have just started the process of searching for a new home builder and aren’t sure what that means, it means that we don’t offer one or two home designs with a handful of materials and floor plan choices to make each project slightly different from the neighbor’s. We work with each homeowner to develop a truly unique combination of design, layout, and exterior construction. That means that you can start the process with a home plan that you have found on your own, or you can begin with one of ours. Each of our plans has a number of appealing standard features, but can be upgraded and adapted however you wish. Today we thought we would feature The Acadia, one of our open concept plans that includes features many people ask about — including a mudroom off of the garage, a home office or study, and a first floor Master Suite. The Acadia floor plan options show how you can customize this design to have the Master bedroom upstairs, a Jack and Jill bedroom configuration for the kids, a sunroom or den with a fireplace, and a covered patio. With this floor plan’s lower level, you can choose to add in design features for a wine cellar, additional living space, or room for your specific hobbies or interests. 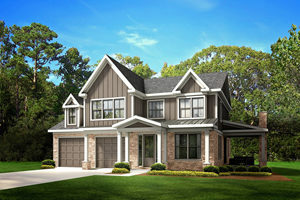 Our detailed elevation images also help clients imagine how unique the exterior of a home built with this plan can be with different garage placement and use of stone, brick and/or siding. 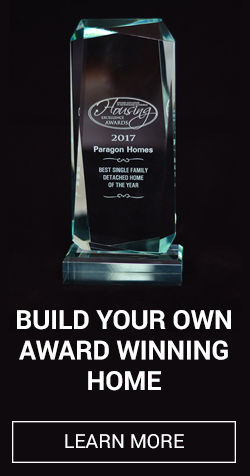 Our online floor plans and images are a great place to get started if you are exploring the idea of building a custom home. But don’t stop there. Set up an appointment with us and we will show you many other other floor plan ideas and materials options, as well as completed projects, to make sure you love everything about your new home!